Summer is already here and it has come with all its vengeance. Temperatures are already soaring high in most parts of the world and people have already started feeling the summer heat. In such weather it is important to drink plenty of water to keep your system cool. Besides that, what you must not miss out are the summer fruits and vegetables. This is because the internal system of the body responds to the seasonal changes and so it is best to eat the fruits and vegetables of that particular season. Similarly, since summer is already here, it is time to eat summer fruits and vegetables. And to help you decide which foods to eat in the summer, I have brought a list of 17 top summer fruits and vegetables that you must not miss out this summer. In the summer, most of us tend to lose our appetite due to the excessive heat outside. We are in no mood of eating heavy foods and instead prefer lighter meals. Due to the humid weather, we perspire a lot and so we need to drink plenty of water. You must also include the seasonal summer fruits and vegetables that contain lot of water in it and will help you keep your body cool and hydrated. Most of the summer fruits and vegetables like watermelon, tomatoes, cucumber, mangoes etc. has the natural cooling effects and are must-have’s in summer season. Moreover, the fruits and vegetables that grows in summer months are fresh and nutritious and helps you stay fit and active all though the summer months. 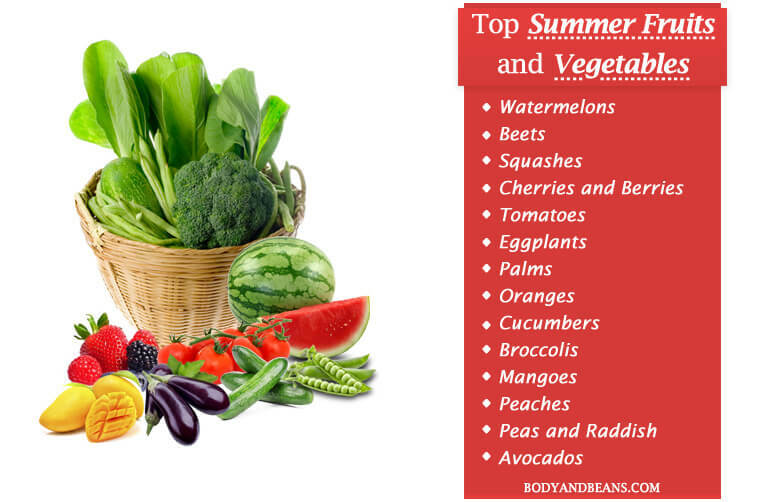 There are many fruits and vegetables that are grown in summer but I have brought you a list of top 17 of them to eat in the summer that will help you beat the heat and stay fit and healthy. I will be discussing about all of them in details but before that, let me state a few reasons why seasonal fruits and vegetables must be eaten or to be more specific why you should eat summer fruits and vegetables in summer. See, each season has its specific set of fruits and vegetables that grows in that particular season. Similarly, the humid weather of summer also favours the growth of several fruits and vegetables. It is always preferable to eat foods specific to that season. There are reasons behind it. So, here are a few most important reasons why you should eat summer fruits and vegetables this summer. Fruits and vegetables that are grown in summer will be found in abundance all through the summer months. So naturally, they will be affordable and you may easily stock them for future usage. Fruits and vegetables of summer season will be naturally grown and hence they will be tastier and more nutritious when eaten in summer months. Also, since, they will be naturally ripened, so it is better to eat them during summer than other seasons where they might be artificially grown. Summer fruits and vegetables get the favourable weather conditions to grow, so naturally they are healthier than the other off-season fruits and vegetables. Most of them retain the natural flavour and colour when grown in summer and so they are very fresh to eat in the summer months. Your summer body will get all the necessary vitamins, minerals, and antioxidants that it needs from the summer fruits and vegetables. Thus, you can remain energetic, active and healthy all through summer. Now, that you know how nutritious the summer fruits and vegetables are for you, I am sure you will not like to miss them. I will be listing you the names of the top summer fruits and vegetables which you must include in your diet chart this summer. By now, you already must have known how important it is to eat the seasonal fruits and vegetables. And now since summer is already here, let us focus on the top 17 summer fruits and vegetables. Below, are mentioned in details about the top foods you can eat this summer. Most of these are easily available and consuming them appropriately will help you deal with the summer heat better. So, without wasting much time, let us begin our discussion on the top summer fruits and vegetables worth eating to beat the heat this season. When it comes to the summer heat, you need to drink lots of water and water containing foods and when it comes to watery foods or in other words, foods that contain water; no one can miss out the juicy watermelons. Watermelon contains around 92% water and so it is one of the tastiest ways to hydrate your body during the hot summer days. Moreover, watermelon is rich in lycopene, which is a phytonutrient that as per reports gives your skin immense protection from the harmful ultraviolet rays of the sun. In fact, not just UV rays, lycopene is great in giving your body protection against cancer and is also known to boost your bone and heart health. Watermelon is personally my favourite summer fruit and given its huge summer benefits, its inclusion in the list of top summer fruits and vegetables is a must. You must include beets in your summer food chart. In the summer due to so much heat, many complain about poor cardiovascular health. People pant a lot, get tired very easily and the humid temperature often increases the risk of strokes. So, it is important to keep your heart healthy and that is what beets will help you do. Beets contain naturally occurring nitrates that are very beneficial to keep your cardiovascular system strong. Moreover, several studies have also confirmed the effectiveness of beet juice in lowering blood pressure, which is often seen to fluctuate a lot in the summer months. And, for the athletes and those who are involved in highly energetic exercises or activities, eating beet this summer is a must. This is because when you eat beet, the nitrates get absorbed and are converted to nitric oxide that in turn reduces your bodies’ need for oxygen and increases its tolerance level to the exercises of high intensity. In comparison to the winter squashes which are of hard shell, summer squashes are tender and the skin is thinner. So, when you eat squashes in summer, you get the whole fruit to eat and naturally, your summer body gets all the rich nutrients contained in them. The skin of the summer squashes is rich in antioxidants whereas the seeds contain good quantity of omega 3 fatty acids. Summer squashes are also rich in several anti-inflammatory carotenoids likezeaxanthin, lutein and beta-carotene that are very good for your eyes. So, do not miss out the healthy squashes this summer. In summer we often experience inadequate sleep due to the humid summer heat which in turn takes a toll on your health. In fact, your body needs proper rest to combat the hectic and hot summer months. So if you also experience inadequate sleep, then worry not as with consumption of cherries you can get a good sleep and maintain good sleep and wake cycles. This is mainly due to the presence of melatonin in them which as per scientific research, help to improve the quality of sleep. Also, just like beets, cherries are also very useful for the athletes and those who perform high intensity exercises. This is because cherries contain several anti-inflammatory compounds and other antioxidants that reduces muscle damage and eases any kind of pain. Therefore, try out the various cherries and stay healthy and strong all through the summer months. As far as the top summer fruits and vegetables are concerned, inclusion of the tomatoes is a must. This is because just like watermelons, even the tomatoes contain the highly beneficial lycopene. So, naturally, it will give you protection from the scorching summer sun rays. Besides that, tomatoes are very instrumental in keeping your heart healthy which is very important for you especially during the stressful summer. Also, the wide varieties of phytonutrients present in the tomatoes provide antioxidant support that in turn helps to improve the blood lipid profiles. Studies have also shown that consuming tomatoes or tomato juices in proper quantity helps you reduce the levels of harmful LDL (bad cholesterol) and triglyceride which is another health benefit that you can derive from them. You may pair the fresh tomatoes with avocado, olive oil and other healthy fats as fats helps in better absorption of the nutrients present in the tomatoes. Eggplant, popularly known as the brinjal in India is a great summer food whose health benefits can never be missed. Generally, while cooking, we peel off the skin but you may try out something different this summer by keeping the skin. The reason I told you this is that, the skin of the eggplant is filled with nasunin, an anthocyanin compound that is proved to improve your cognitive functioning. It protects the membranes around the nerve cells that contains lipid. Among other benefits, eggplants contain various other phenolic compounds and antioxidants that protects you against damage caused by the free radicals as well as improves the flow of blood to the heart. Thus, you and your family must eat eggplant this summer and enjoy good health. Berries are one of the top summer fruits and vegetables and are a great summer snack option for you. There are various types of berries that you get in summer like for example strawberries, blueberries, raspberries, blackberries etc. All of these are very nutritious and are packed with fibre, Vitamin C, anthocyanins and other antioxidants and hence are a must have during this summer. Moreover, as compared with the other fruits, berries are low in sugar which gives you yet another reason to eat them. The various colours of the berries are due to the anthocyanins present in them which also makes them anti-inflammatory agents that can even cure the memory loss which occurs with age. So, you can munch on these juicy berries and even sprinkle some on top of smoothies, yogurts, oatmeal etc to add on to the taste. I understand that not many consider palms in comparison to the other colourful summer fruits and vegetables but as far as their benefits are concerned, they can never be ignored. Palms are highly nutritious containing several important nutrients in them with potassium, zinc, iron, and vitamins (Vitamin B2, B6, C) being the significant ones. Palms are also low on calories and so there is no tension of unnecessary weight gain as well. The juicy oranges are a must this summer. Oranges contains potassium which is very important during summer days. This is because in summer, you sweat a lot and the potassium is lost in the process that in turns increases the possibility of you getting affected by muscle cramps. Oranges replenishes your system and helps you ease the muscle cramps. Also, these are one of those water containing fruits having 80% water which keeps you hydrated throughout the humid summer months. So, kindly do not miss the oranges and enjoy their juicy taste in the humid summer. There are two distinct varieties of figs, one that grows during the fall and the other during summer. You can definitely try out the one which is generally harvested from the month of June. This one is less sweet than the one grown during fall. Figs are a good source of fibre and so if you have problems with your digestive system which is quite common during summer, figs are a good option for you. In addition, figs are probiotic in nature. In other words, they contain probiotics which is a type of carbohydrate that is known to support the good bacteria in our gut. This is extremely beneficial for your summer body. Cucumbers are my all time favourite and they are definitely one of the top summer fruits and vegetables that you must never skip during the summer months. As, we know that the summer body gets dehydrated easily and so besides water, you have to eat foods containing water and cucumber is definitely one food to eat during this time. Cucumbers keep your system cool and also provide you with enough nutrition. They are rich in potassium and Vitamin K that are good for your summer body. In fact, not just your health, your summer skin also needs care and cucumbers are great in protecting your skin against the summer heat. So, if you want to keep your system refreshed and cool, then please do eat cucumbers as much as possible. If you are a veggie, then broccolis must definitely be on your summer diet chart. This green vegetable is a powerhouse of nutrients with Vitamin A, Vitamin C and some other minerals being the most important ones. Broccolis are good for your heart and bones. They also strengthen your eyes and are known to prevent diabetes. And if you are allergic prone that is quite common during summer heat, then they are good for you as broccolis may soothe that as well. You may eat broccolis raw, steamed or boiled to reap all its medicinal benefits. Most of us will never miss out the juicy mangoes when it comes to top healthy and tasty summer fruits and vegetables. The juicy mangoes are great for summer. They are great to taste and give us immense relief from the summer heat. In fact, not just taste, they are good for your health as well. Research has shown the presence of several antioxidants in mango, that makes it one of the healthiest summer fruits. The most important summer benefit that mangoes give is protection from the summer heat stroke. Besides, they also prevents the occurrence of cancer, treats kidney stones, and is also said to be good for the pregnant mothers. You can definitely eat peaches this summer. This sweet and succulent fruit is very satisfying to eat. Loaded with minerals and antioxidants like iron, fluoride and potassium, peaches are highly nutritious. Peaches can boost your digestive process, improve cellular health, treat blood stasis as well as strengthen your nervous system. Moreover, your body is exposed to several toxins in the summer months and peaches are ideal to detoxify your system and keep it healthy. So, try out the firmer peaches of bright orange or yellow this summer. Shell peas are also a good summer try specially if you want to boost your levels of folic acid, Vitamin K, Vitamin D.Peas can give you several benefits with improving vison, treating Alzheimer’s,curing you of celiac disease being only a few of them. They are also good in repairing broken tissues and can combat early aging in individuals. However, try to eat them fresh as if left for several days, they may turn starchy and dry. Often thought to be a summer vegetable, avocados are technically a fruit but whatever may be the confusion they definitely are one of the best summer fruits and vegetables you can have. Loaded with abundance of folate, potassium and vitamins, avocados are a unique fruit with numerable health benefits. To mention a few, avocados are good for your heart and helps prevent heart attacks. They are also believed to increase one’s longevity and heal wounds faster. Besides, they are also good for your eyes and liver. So, eat avocados this summer and stay strong and energetic even in this summer heat. You may have overlooked it many times, but this root vegetable is very nutritious and deserves a position in the list of top summer fruits and vegetables. Radishes are loaded with Vitamin C and flavonoid antioxidants and are very healthy. Among the several health benefits, radishes are good for your kidney and can treat your problem of piles. They also have the potential to treat your fever and prevent leukoderma. You may treat your urinary disorders also with radishes. Summer months can get really stressful in many parts of the world with India being a big example. Most parts of India experience too much summer heat where every year we hear many death cases due to sun stroke. While it is difficult to control the summer temperature, one can definitely take protection against it. However, there are several ways of protecting your body, one of them being eating healthy nutritious summer foods. And, as far as food is concerned, you must never miss the fruits and vegetables. However,it is not just any fruit or vegetable, here I specially mean the summer fruits and vegetables. Seasonal fruits and vegetables are best eaten in that particular season. This is because the quality of the food is fresh and hence nutritious. Moreover, they retain the best natural colour and texture as these are grown naturally in favourable climatic conditions and so there is no mixing of pesticides involved. So as a result, you get the whole fruits and vegetables loaded with nutrients that are extremely good for your summer body. Summer fruits and vegetables like watermelon, berries, oranges, cucumbers etc are great for your summer body. Most of them contain enough water which keeps your body hydrated. They protect you from sun stroke, dizziness, fatigue feeling etc. In short, they try to keep your immune system strong and help your body adjust to the change in temperature outside so that you stay fit and energetic all through the summer months. In fact, besides your health, your skin and hair also gets damaged in the humid climate. So, if you eat the top summer fruits and vegetables, your skin and hair will also receive the healthy nutrients and naturally glow even in the heat. Are you fed up of the summer heat? Have you checked out my list of top summer fruits and vegetables? Do check it and share me your feedback in the comments section. You are free to suggest and include some other foods in my list of summer fruits and vegetables. And, if you feel my post to be interesting, please do like, comment and share the article with others. Hey, I love your post. I recently wrote an article on preserving beef. I like to make my own food for Christmas!.